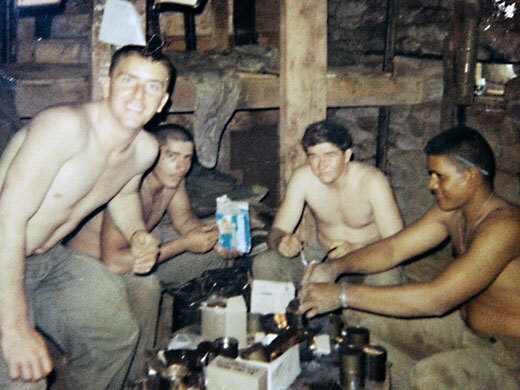 This is me and friends eating C rations in underground bunker; four marines dining. I am second from right. C rations were canned food still left over from WW2. Thankfully we finished them and got an updated version with different foods but still boring as hell. In the photo above I am in second row far right. We were filling sand bags at Con Tien base (1968). Con Tien was on the DMZ (demilitarized zone). On a clear day you could see Northern soldiers walking around. 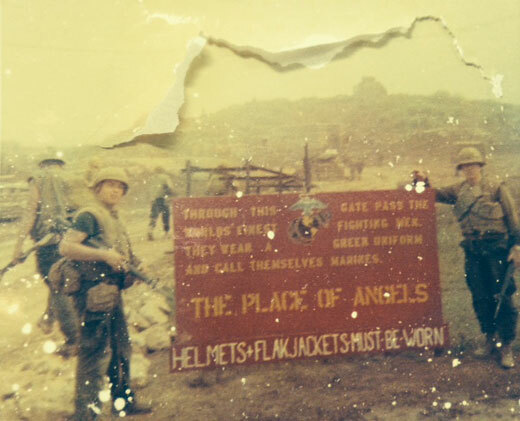 We had to wear helmets and flak jackets because we were always being attacked with rockets, mortars and artillery. On some days we received 1000 to 2000 incoming rounds in a 24-hour period. At night the North Vietnamese Army would attempt to get inside our perimeter. 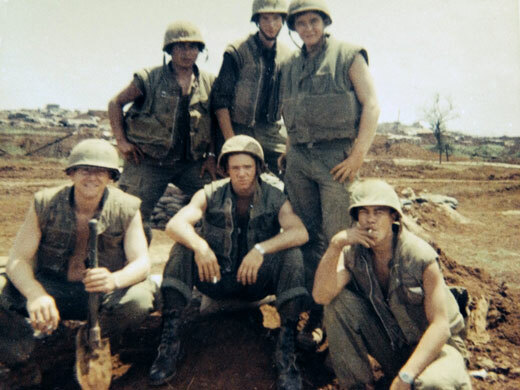 We had barbed wire and mine fields in front of our fighting holes which were dug underground and then roofs were covered with sand bags several feet thick. Next to the fighting hole was the place where we slept, connected by a trench, also underground and reinforced sides and roof with sand bags. Con Tien meant Place of Angels or hill of angels. They looked over me for sure. Above: The Place of Angels in Don Quay, where Project Renew is situated now.